Kitchen & Culinary Accessories: HIC, Preserve, Norpro, RSVP! • Three-in-One Lunchbox Set: Three-in-One Lunchbox contains three containers stacked together as a lunch box set. This stylish bento container makes it easy to pack a variety of foods and keep them all separate and safe from squishing! Also works great for portion control. Three-in-One is perfect packing a healthy entree and two side dishes. Kid-tested clips can be adjusted looser or tighter. This best-selling bento, the Three in One is made with durable, 100% high-quality, food-grade stainless steel. Container is not leak-proof since no plastic gaskets are used. Not for use in the microwave. BPA Free, plastic-free and waste-free and Dishwasher safe. • 2-Piece Oval Lunchbox Set: 2-piece Oval Lunch Set includes a large oval container plus a smaller cup that's ideal for sauces, dips or other wet foods which can either be packed separately or inside the larger lunchbox. Great for portion control. Go back to school plastic-free with the durable, reusable, toxin-free, Oval Lunch Set for your lunches. Total capacity (oval lunchbox and cup) 30 oz. (3¾ cups). Oval Lunchbox capacity is 24 oz. (3 cups), measures 6½" long x 5" wide x 2" tall. No-leak Cup capacity is 6 oz. (¾ cup), measures 1½" tall x 3¼" diameter. Cup lid is BPA-free #4 LDPE plastic and hand washable. Steel containers are dishwasher safe. ORDER NOW! • Tri Bento Lunchbox Set: Elegant Tri Bento Lunchbox is a round, 100% high-quality BPA-free stainless steel 3 tier round container for stacking and packing your favorite lunch foods is as easy at 1-2-3. Eco-friendly design presents three separate layers which neatly clip together with easy-to-use clips that won't pinch. Great for portion control. Container measures 5¼" high with base 5¼" diameter. Total three layers capacity holds 38 oz. (4¾ cups) and each layer holds 12 oz. (1½ cups). Non-toxic, free of BPA, BPS, and phthalates. Dishwasher safe. Not for use in the microwave, and not leak proof since no plastic is used. ORDER NOW! • Solo Cube Lunchbox Set: Solo Cube is a basic Sandwich Box, without the plastic! This stainless steel, square Lunch Box with lid is a sturdy, squish-proof, reusable food container perfect for sandwiches, pasta salads, and left-overs. Great for portion control. Measures 5¼" square by 2" deep, and holds 21 oz. (2½ cups).Non-toxic, free of BPA, BPS, and phthalates. Dishwasher safe. Not for use in the microwave, and not leak proof since no plastic is used. ORDER NOW! • Solo Rectangle Large Lunchbox Set: Durable, 100% stainless steel Solo Rectangle Lunchbox with lid is for longtime use at lunchtime, in the great outdoors for camping, boating, picnicking, and other on-the-go activities. Ideal for portion control and mindful eating. BPA Free and Dishwasher safe. Not for use in the microwave. Not leak proof. Contains 29 oz. (3.6 cups) and measures 4¾ wide x 6¾ long x 2 tall inches. ORDER NOW! • 3-Section Kid's Tray & Camping Tray: Kid's Tray and Camping Tray are perfect for use in your home or outdoors as food trays, mess trays, and cafeteria trays for picnics, camping or BBQ potlucks. ECOlunch stainless steel Camping Tray is a new eco-friendly answer for entertaining that's 100% waste free, plastic free and non-breakable! Does not include a lid. Camping Tray is divided with 3 sections. Camping Tray measures 8¼" x 9¾" x ¾" tall Non-toxic, free of BPA, BPS, and phthalates. Dishwasher safe. Not for use in the microwave. ORDER NOW! Higher tested European-grade Silicone is sturdier, more bendable and durable to keep its original shape and non-stick qualities through more uses. Durable design supports on its own; flexes to pop out foods with ease; naturally non-stick for quick release; no stuck-on foods or messy cleanup. • Mrs. Anderson's Baking Silicone Pan Muffin 12 Cup: Mrs. Anderson’s Silicone Muffin Pan is perfect to Make 12 standard-sized muffins; great for muffins, cupcakes, popovers, mini cheesecakes, gelatins, and more. ORDER NOW! • Mrs. Anderson's Baking Silicone Pan Loaf 9.5 x 4 x 2.5 inches: Mrs. Andersons Silicone Loaf Pan is ideal for baking pound cake, coffee cake, banana bread and zucchini bread, fruitcake, meatloaf recipes, and more. ORDER NOW! • Mrs. Anderson's Baking Silicone Cake Pan Square 9 x 9 inches: Mrs. Andersons Silicone Cake Pan makes 9-inch cakes; perfect for baking birthday cake, layer cakes, cheesecakes, coffee cake, cornbread, and more. ORDER NOW! • Mrs. Anderson's Baking Silicone Cake Pan Round 9.5 inches: Mrs. Andersons Silicone Cake Round Pan makes 9-inch cakes; great for baking birthday cake, layer cakes, cheesecakes, coffee cake, cornbread, and more. ORDER NOW! Made from FDA-approved silicone and natural glass fibers for even heat transfer; non-porous surface prevents cross contamination of food. Naturally non-stick for quick release of foods and easy cleanup; no greasing or added oils necessary; sturdy and reusable for thousands of uses. Temperature safe for use in the oven and freezer (-40 degrees to 480 degrees Fahrenheit); reusable and more economical than using parchment paper. • Mrs. Anderson's Sweet N' Savory Baking and Roasting Set 2 pc: Mrs. Anderson's Non-Stick Silicone Baking Mats for baking cakes, breads and pastries, plus roasting meats and cooking sweet and savory dishes. Meausres 11.6 x 16.5 inches; fit standard baking sheets; durable and reusable; more economical than using parchment paper; wipe with a clean, damp sponge. ORDER NOW! • Mrs. Anderson’s Baking Non-Stick Silicone Bread Crisping Mat 11.6 x 16.5 inches: Mrs. Anderson's Non-Stick Silicone Half-Size Bread Crisping Mat for crisping and baking bread, dinner rolls, biscuits, pastries and other baked goods. 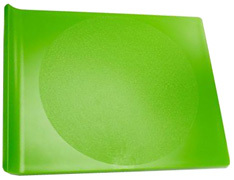 Measures 11.6 x 16.5 inches; specially sized to fit half-size baking sheets; durable, reusable and easy cleanup; wipe with a clean, damp sponge. ORDER NOW! • Mrs. Anderson's Non-Stick Silicone Baking Mat 11.6 x 16.5 inches: Mrs. Anderson’s Half-Size Baking Mat is perfect for baking biscuits, breads, cakes, cookies, pastries, and savory dishes. 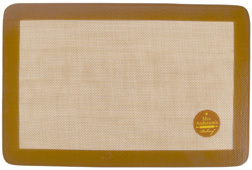 Measures 11.6 x 16.5 inches; fits standard 13-inch x 18-inch baking sheets; easy to clean; wipe with a clean, damp sponge. ORDER NOW! • Mrs. Anderson's Non-Stick Silicone Jelly-Roll Baking Mat 9.5 x 14.4 inches: Mrs. Anderson’s Non-Stick Silicone Jelly Roll Mat for baking jelly roll cake, breads, dough, and other pastries, and cooking sweet and savory dishes. Measures 9.5 x 14.38 inches; specially sized and designed to fit a standard jelly roll pan; wipe with a clean, damp sponge. ORDER NOW! • Mrs. Anderson's Non-Stick Silicone Toaster Oven Baking Mat 7.9 x 10.9 inches: Mrs. Anderson’s Non-Stick Silicone Toaster Oven Baking Mat for toasting, reheating, melting, browning and baking foods in convection and toaster ovens. 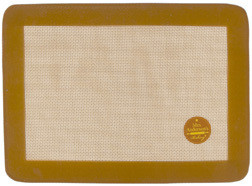 Toaster Oven Baking Mat measures 7.9 x 10.9 inches; fits standard convection and toaster ovens; use directly on the rack without special bakeware; wipe with a clean, damp sponge. ORDER NOW! Mrs. Anderson’s Baking Silicone Bread Crisping Mat 11.6 x 16.5"
Mrs. Anderson's Silicone Toaster Oven Baking Mat 7.9 x 10.9"
HOME CARE: Mrs. Anderson's Sweet N' Savory Baking & Roasting Set 2 pc. Measuring Cup Set Green 4 pc. | Funnel Set 3 pc. • Canning Funnel Wide Mouth: Canning Funnel 5 1/8" top opening tapers to 2¾" diameter neck opening, Stainless Steel. Made of non-reactive, dishwasher safe 18/8 Stainless steel. Flat rim with handles for stability and easy grip. Made in China. ORDER NOW! • Endurance Splash Measuring Spoon Set Green 5 pc. : (1 Tablespoon, 1 Teaspoon, ½ Teaspoon, ¼ Teaspoon and 1/8 Teaspoon) Endurance Splash Measuring Spoon Set of 5 will complement an extra splash of color to your kitchen. Made from high quality 18/10 Stainless Steel, each measuring spoon adds color with a sturdy acrylic insert in the handles. Each measuring spoon has measurements marked in both the handle and the back of the spoon. All five of these nesting measuring spoons have a hole in the handle which comes looped with a removable chain. Dishwaher safe. Made in China. ORDER NOW! • Measuring Cup Set 4 pc: Made from 100% BPA free, recycled #5 plastic. The Preserve Measuring Cups are a four piece set with 1 cup, 1/2 cup, 1/3 cup and 1/4 cup measures. The cups nest and snap together for easy storage. The rounded bottom of the cups allows for easy release of dry ingredients. Made in USA. ORDER NOW! • Funnel Set 3 pc. : Three-piece funnel set, includes 1 ¾", 2 ¼", and 3" diameter funnels. Ideal for fitting small bottles and containers. Made of professional gauge 18/10 stainless steel. Ring connector for keeping together when stored. Dishwasher safe. ORDER NOW! Canning Funnel Wide Mouth 5 1/8". Measuring Spoon Set Green 5 pc. Measuring Cup Set 4 pc. HOME CARE: Canning Funnel Wide Mouth, 5 1/8"
HOME CARE: Endurance Splash Measuring SPOON Set Green, 5 pc. HOME CARE: Measuring CUP Set Green, 4 pc. HOME CARE: Funnel Set, 3 pc. • Mixing Bowl Set 3 pc. : Mixing Bowl set includes three nested bowls (2 quart, 3 quart, and 4 quart). Durable Bowls are wide for easy mixing with an easy grip handle, and Spout for pouring batter and sauces. Includes Apple Green 4 quart bowl, Spring Green 3 quart bowl and Lemon Yellow 2 quart bowl. 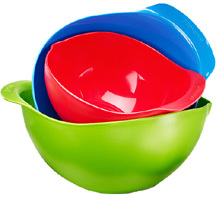 Mixing Bowl Set is made from 100% BPA free, recycled #5 plastic. ORDER NOW! • Mason Jar Pour Spout, Stainless Steel: Mason Jar Spout Tap converts a mason jar into a dispenser for salad dressings, flavorful oils, spirits and water in the jar and pouring liquids neatly. Made from durable stainless steel with a silicon seal for lifetime usage, and fits standard 8-oz., 16-oz. and 32-oz. Mason jars (not included). Dishwasher safe. Made in USA. ORDER NOW! • Mason Pour Spout Set 4 pc. : Mason Pour Spout Set contains all you need for storing and dispensing your favorite drinks and more. Use the jars and pourer for infusing oils, making spirits, and even salad dressings. 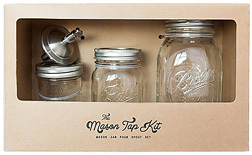 Mason Pour Spout Set are a must for the at-home bartender who loves to entertain, and make delicious cocktails. 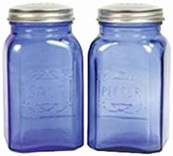 Includes glass jar each of 8 oz., 16 oz. and 32 oz., and Mason Jar Pour Spout. Made in USA. ORDER NOW! Mixing Bowl Set 3 pc. Mason Pour Spout Set 4 pc. HOME CARE: Mixing Bowl Set 3 pc. HOME CARE: Mason Pour Spout Set 4 pc. 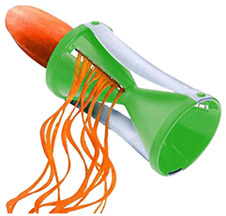 • Easy Sprout Sprouter: The revolutionary system that makes sprouting amazingly convenient. Everything is easier - soaking, rinsing, sprouting, storing, and serving. Easy-Sprouting turns natural seeds into tiny dynamos of energy, rich in enzymes, vitamins, minerals, and other important food values. Easy-Sprout is the ideal "finger-tip garden" anywhere and anytime without soil or sunshine. The unique dual-container system: uses heat from sprouts to circulate fresh, humidified air by convenction prevents suffocation and dehydration so sprouts need less (or NO) rinsing. Grows pound batches of healthier, tastier sprouts faster with minimal effort. Designed with a a VENTED LID that is ideal for "travel sprouting" and storing sprouts in the refrigerator. Stackable, durable and easy to clean, EASY-SPROUT is made from the finest qualityfood grade materials. Consists of a bottom-draining inner container in which the seeds are sprouted, an outer container which holds the inner container in a raised or lowered position. Other parts include an Alfalfa insert which snaps into bottom of inner container for small seeds; a dome which sets over inner container to retain heat and moisture, and doubles as measuring cup; and a cover for refrigerated storage. ORDER NOW! • Salad Spinner Collapsible: Highly efficient Salad Spinner basket doubles as a colander and the beautiful outer bowl is used for serving salad in after washing and spinning dry. The salad spinner features a self-retracting pull-cord for quick drying and a push button stop. Salad Spinner collapses to half its size for compact flat storage, expands to full size for use. Non-skid ring on base keeps salad spinner in place while using. Dishwasher safe. 3 Quart. ORDER NOW! • Garlic Baker 5" Terra Cotta: For microwave or conventional oven. ORDER NOW! 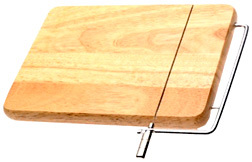 • Wood Cheese Slicer 10 inch: This practical Cheese Slicer doubles as a convenient serving piece. The cutting wire sinks easily, even the hardest cheese, to produce a perfect slice, thick or thin, every time. Made of a classic, heavy duty wooden base and has a durable stainless steel handle. High quality and easy to use. Not dishwasher safe. Measures 10" x 7". ORDER NOW! HOME CARE: Garlic Baker Terra Cotta, 5"
HOME CARE: Wood Cheese Slicer, 10"
Marble Mortar & Pestle: Mortar and Pestle is designed to facilitate fine grinding of a wide variety of herbs, spices, or grains. This centuries old method is still considered the best way of releasing the true aromatic flavors of fresh herbs and spices. Use it again and again for pestos, homemade curry powder and spice rubs - it's made to last a lifetime. The genuine marble of this mortar and pestle set keeps odors and grease from penetrating. Set looks attractive on the outside with a high-gloss finish, but has a buffed inside to better grind spices and other ingredients. Classic shape and easy to clean. A great gift that adds style to any kitchen. Dishwasher safe. • Mortar & Pestle Marble Green: Measures 3 3/8" x 1¼" bowl. ORDER NOW! Marble Mortar & Pestle: This marble mortar and pestle set will be a beautiful addition to your herbal tools. Gently grooved for easier grinding, the mortar has a heft to it that makes it hard to tip or spill. • Mortar & Pestle Marble Black: Measures 4" high by 4" wide. ORDER NOW! 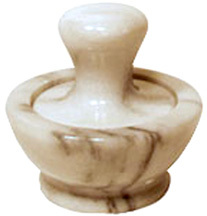 • Mortar & Pestle Marble White: Measures 4" high by 4" wide. ORDER NOW! • Mortar & Pestle Bamboo: 4" Bamboo Mortar and Pestle features a straight-up bowl and wide pestle designed for quick, efficient grinding. It's a traditional design that gets the job done. Bamboo is less absorbent than wood and therefore easier to keep clean and sanitary. It is also a sustainable resource. Made of natural, caramelized bamboo (oven baked to achieve a dark, caramelized color). Dimensions: 4 inches tall. ORDER NOW! HOME CARE: Mortar & Pestle, GREEN Marble, 3 3/8"
HOME CARE: Mortar & Pestle, BLACK Marble, 4"
HOME CARE: Mortar & Pestle, WHITE Marble, 4"
HOME CARE: Mortar & Pestle, BAMBOO, 4"
• Glass Shaker 3-Way Adjsutable: Sprinkle everything from spices to herbs to coconut. Simply turn the heavy duty stainless steel lid to choose from three different hole sizes or solid cover. Use the 1/16 inch holes for flour, sugar, cinnamon, and spices. Use the 1/8 inch holes for crushed pepper, sprinkles, and larger spices. Use the 1/4 inch holes for coconut, and dried herbs. Wide mouth for easy refill. Sturdy glass body. Measures 5½" x 2¾" x 2¾" and holds 6 oz. Dishwasher safe. ORDER NOW! • Retro Salt & Pepper Shakers Blue: Two 8 oz. capacity shakers with wide, stainless steel screw-on lids. Handwashing is recommended. Measures 4½" x 2¾". ORDER NOW! • Mortar & Pestle, White Porcelain 3 pc. : Mortars and pestles have been around for thousands of years and long before kitchens existed they were already a classic utensil and they do the job of crushing, grinding and powdering herbs, grains, spices, nuts, roots, teas and all kinds of healthy eats. This style of grinding releases flavor best in seeds, herbs, spices and garlic. Mortars and pestles are handy for crushing pills and supplements, too. This set of 3 mortars and pestles have contoured bottoms and pestle head to hold the grindables in place. Porcelain is easy to clean, dishwasher safe and won't absorb food odors or stain. Matches any bathroom or kitchen decor. 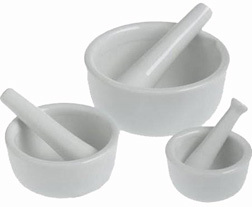 with three coordinating Pestles: 2 ½", 3 ¾", and 4 ½". ORDER NOW! Mortar & Pestle, White Porcelain 3 pc. HOME CARE: Mortar & Pestle, WHITE Porcelain, 3 pc. 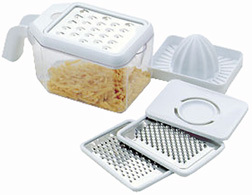 • Multi Grater w/ Juicer: Shreds and grates cheese and vegetables. Separates egg whites from yolk and juices fruits. Features dry, liquid, metric and ounce measurements with pour spout! Includes 3 stainless steel grater blades, Egg Yolk Separator and Juicer attachments. Dishwasher safe. 2 ½ cups or 20 oz. ORDER NOW! • Covered Butter Dish: Georgeous bright 18/10 stainless steel extra large butter dish holds multiple sticks of butter or a block of cream cheese. Holds ½ Cup or ¼ lb. Boxed and ready to give as a gift. Measures 7 ½" long x 4" wide. ORDER NOW! • Sprayer Mister 6 ¼": Perfect for use with vinaigrettes and other flavorful marinades and dressings. Filter helps separate herbs for a steady flow of flavor. Stainless steel, with a plastic reservoir. 1/3 cup/3 oz/80 ml capacity. Measures 6¼" tall by 2 3/8" in diameter. BPA free. Made in China. ORDER NOW! HOME CARE: Sprayer Mister, 6 ¼"
• Hand Crank Popcorn Popper: Popcorn the old fashion way. Made from non-rusting aluminum with a flat bottom for quickest possible conduction of heat from the stove top to the popcorn kernels. Continuous turning of the crank triggers the internal stir paddle as it spins the stir paddle, turning each kernel to assure even heating and a even distribution of oil. Non-anodized. Do not put in dishwasher. Large 4 quart capacity, 7" tall and 7½" diameter. ORDER NOW! 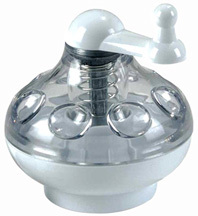 • Spice Grinder: Ideal for grinding fresh spices with ease --- nutmeg, ginger, peppercorns, rock salt and other spices. Conveniently store your ground spices in the grinders body. Comfortable, easy to turn handle. The best nutmeg flavor comes from freshly grated nutmeg. This smart tool takes the danger out of grating whole nutmeg. Great for flavoring foods from sauces to drinks such as cappuccinos. Measures 3½" x 3" x 3". It holds a ¼ cup. ORDER NOW! • White Marble Spice Grinder: Prepare freshly ground gourmet seasonings and spices in your own kitchen with this White Marble Spice Grinder (Mortar and Pestle Set). This beautiful white marble Sprice Grinder has a 4 ounce capacity and features a unique modern design that traps all the herbs in the mortar under the pestle grinding spices and seasonings much more efficiently than traditional mortar and pestle sets. Marble Spice Grinder is constructed from beautiful white marble to provide a rugged and attractive easy to clean kitchen accessory. 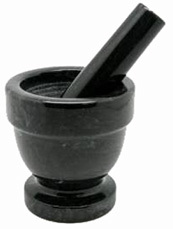 Large handle on pestle is comfortable to hold and use. Unique wide pestle design grinds seasonings and spices much more quickly and efficiently than narrower mortar and pestle sets. 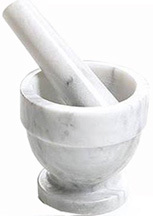 Beautiful white marble pestle and mortar looks too good to put away when not in use. 3" x ½" bowl, 4 oz. capacity, 2.3 lbs., White Marble. To clean, wipe with a damp cloth. ORDER NOW! HOME CARE: Hand Crank Popcorn Popper, 4 qt. HOME CARE: Spice Grinder, 3 ½"
• Kids Wooden Tool Set 9 pc: Includes 2 spoons, 2 tart tampers, meat hammer, rolling pin, spatula, tongs and whisk. ORDER NOW! • Natural Peanut Butter Mixer: A new, innovative, award-winning device will easily stir the peanut butter in the original containerwithout splashing the oil. It conveniently cleans the mixing rod upon removal from the jar. 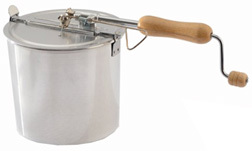 Natural Peanut Butter Mixer features a chrome-plated stirring rod and handle. A coated-steel lid provides rigid support for the hand mixer and a durable molded plastic knob spins freely to facilitate turning the crank. A bearing collar on the mixing rod seats snugly inside a chrome-plated lid grommet to provide a smooth, even rotation. A white nitrile gasket made from FDA approved materials is fastened underneath the lid and effectively cleans all peanut butter from the mixing rod upon removal from the jar. For additional convenience a polypropylene liner is easily released by pulling a side tab to facilitate cleaning the peanut butter from underneath the lid. This unit is designed to fit a 16 oz. jar that is 4¾" high with a 77mm. diameter lid. Measures 8 x 5 x 1 inches. ORDER NOW! • Aerolatte Milk Frother with Stand, Black: Aerolatte Milk Frother is the ideal hand-held tool to froth milk quickly. The battery-operated Milk Frother works well with hot and cold milk to make delicious drinks like hot chocolate, cappuccino, espresso and more. Stainless steel Long wand sits on durable plastic Stand. Requires 2 AA batteries (included). Measures 3.5 L x 1.13 W x 8.62 H inches. ORDER NOW! • Spoon Holder: Vertical spoon holder takes less space than lay-flat spoon rest. Made of stainless steel. Measures 7" tall. Perfect gift idea! Spoon not included. ORDER NOW! Kids Wooden Tool Set 9 pc. HOME CARE: Kids Wooden Tool Set, 9 pc. HOME CARE: Peanut Butter Mixer, 4 ¾"
HOME CARE: Spoon Straw Set, 4 pc. • Drip Coffee Maker w/ Pot, White Porcelain: Drip Coffee Maker includes a porcelain pot with lid and a porcelain #1 coffee filter cone. This beautifully white glazed ceramic Coffee Maker quickly makes two cups of coffee. Simply place a coffee filter and grounds in the cup-shaped strainer, then pour hot water over the grounds. Great for any kitchen and home. Simply place a coffee filter and grounds in the cup-shaped strainer, then pour hot water over the grounds. It's easy and microwave, freezer and dishwasher safe. Holds 2¼ Cups or 19 oz. ORDER NOW! HOME CARE: Drip Coffee Maker w/ Pot, 19 oz. • Compost Keeper Ceramic White: Nice-looking White Ceramic Compost Keeper that will look good on any counter top. Has a durable stainless steel handle for easy transport. Store peelings, egg shells, coffee grounds, greens, clippings, fruit and vegetable scrapes for transfer to your garden compost. Includes charcoal free odor preventing filter in lid. Measures 8" x 10½" and capacity 1 gallon. BUY NOW! • Compost Keeper Ceramic Floral Blue: The Compost Keeper is a one gallon beautiful ceramic jar blue floral design on white ceramic. It is thick and sturdy. It looks good on a kitchen counter top. Store peelings, egg shells, coffee grounds, table scraps, clippings and other vegetables. Later remove to your garden compost pile. The compost keeper works best as a temporary holder for these items. Has a durable stainless steel handle for easy transfer. Measures 8" x 10½" and capacity 3 Quart. Includes 2 Charcoal Filter. BUY NOW! • Compost Keeper Replacement Filter Set: Contains 2 Charcoal Replacement Filters for use with Ceramic Compost Keeper (#222390, #222392 and #222393). Change the filter approximately every 6 months, depending on use. That time can be affected by heat and humidity in your area. The filter should never get wet. Do not wash and reuse the filter. The charcoal in the filter absorbs the odors and once it has fully absorbed to its maximum, discard filter. To Replace Filter: just pull old filter out and toss. Inside replacement packet are two filters. Just place one filter in the lid. Each filter is 5.7" in diameter and is made of PET (Polyethylene Terephthalate), 5% Charcola, 95% PET Acrylate. BUY NOW! • Compost Pail Stainless Steel: The Compost Keeper is a one gallon beautiful satin finish stainless steel with a thick and sturdy stainless steel handle. It looks good on a kitchen counter top. Store peelings, egg shells, coffee grounds, table scraps, clippings and other vegetables. Later transfer to your garden composter. The compost keeper works best as a temporary holder for these items. Measures 11" x 7" and capacity 1 gallon. Includes dual odor preventing filter set in lid. BUY NOW! • Compost Pail Replacement Filter Set: Contains 2 Charcoal Replacement Filters for use with Stainless Steel Compost Pail (#213736). Effective odor control with these double charcoal filters. Long lasting: Each filter lasts about 4-6 months. The rounded filter fits in top section and the square one in the bottom section of the lid of the Compost Pail Stainless Steel. Filter sizes are: The round one is 6½" in diameter and the square one is 4¾". BUY NOW! HOME CARE: Compost Keeper Ceramic, 8" x 10"
• Slicing & Dicing Spiral Slicer: Slicing & Dicing Spiral Slicer, a favorite kitchen tool, you can create Fresh, Delicious, Healthy Home-Cooked Meals quickly and easily. Turn firm vegetables & fruits into Curly Julienne Strips. Use it with Carrots, Zucchini, Cucumbers, Beets, Radishes, Apples, Parsnips and more. Turn The Boring Into The Irresistible: Simply use your Spiral Slicer to create long curly strands of vegetables for healthy low carb meals, stunning salads, tempting stir fries and even fancy garnishes! Even picky vegetable eaters and CHILDREN will love will ask for seconds. Want To Live A Healthier Lifestyle? This Is For You! Replace high carb and high calorie pasta and noodles with fresh, invigorating, low calorie vegetable meals. You'll feel lighter and more energized as you absorb more vitamin and minerals content from you FRESH vegetables. Convenient and Easy To Use: This practical tool fits perfectly in your hand. With no machine to assemble, just grab and use. It actually works better than far more expensive models. 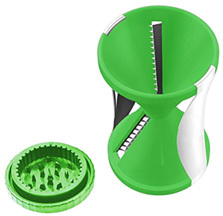 Your new Spiral Vegetable Slicer fits easily in your kitchen drawer, is dishwasher safe and very easy to clean. Your prep work will become a snap. Measures 4¾" x 2¾". BUY NOW! • Frost Pop Maker: Just right for entertaining and enjoyment to your family and friends. Make your own flavors, personalized for each individual. Use fresh fruit juice, fresh fruit, or make gourmet flavors with yogurt, ice cream or pudding. Designed with soft grip, reusable handle with a drip tray. Slim stylish design uses less freezer space. Ideal for kids and adults! Recipes on the box. Measures: 10¼" x 7" x 3¼". Makes eight 2 oz. pops. ORDER NOW! 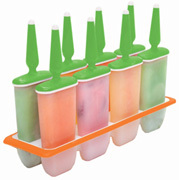 • Frozen Ice Pop Maker: JMake treats using juices, purees, yogurt, applesauce, gelatin, fruit, ice cream and pudding. Sturdy plastic with grommets in lid to hold sticks upright and straight. Includes 24 wooden treat sticks. Measures 4" x 9" x 5½" and makes 10 3 oz. pops. ORDER NOW! • Collapsible Market Basket: Designed with outside zippered pocket and 3 inside pockets, two for keys and cell phone and the other with velcro closure. 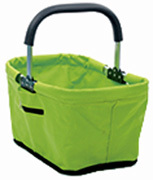 Made with Green polyester fabric and a lightweight aluminum frame. Comfortable rubber handle. Ideal for picnics, shopping, and holding supplies, taking it anywhere you go. After use, just collapse and store it easily. Measures 11 x 9½ x 4 inches, Green Polyester (collapsible). ORDER NOW!